The 19th century is marked by among other things, the theory of utopian, capitalists’ development, and increasing urbanization. With the development of the large scale industries, urban cities had developed and by mid 19th century, 15% was urbanized (Moudon 1997, p. 5). Urban city by this time had similar characteristic; control by the private sector, rapid economic growth, weak governmental control limited to market places, unplanned and unorderly development, overcrowding, shortage of houses, poor sanitation, increased public health hazards, and diseases epidemics. The solution to these challenges lay in better city plans. This essay will discuss two new city plans of the 19th century, Cerda’s plan for the Extension of Barcelona and the Garden City Movement. The discussion will explore the features of each through diagrams and illustrations then the spatial differences and instrumentalities between the two then make a conclusion. The cerda plans of 1860 were postulated by Ildefons Cerdà. The plans have stood out as having contributed greatly to the status of present day Barcelona because of the unique way they were conceived especially in the provision of services to the population (Kropf 1996, p. 255). The plans for the city were based on an in-depth socio-statistical study of the city’s population. The high mortality rate of the middle and lower working class and the poor health and education lead Cerda to design the new city plans which he defined as “urbanism”. The primary objective of Cerda’s new city plans was t to realize a better wellbeing for the city population trough provision of proper houses and rational housing conditions as well as provision of essential services (Pallares-barbera et al. 2011, p. 124). Cerda plans allocated space for marketplaces, hospitals and schools. The first part of the plans indicates the political and urban pre-conditions of the city of Barcelona on which the plans are based. The second part uses location theory and geographical information system to analyze how the population is served by the various social amenities. To keep in track the expansion of the city, topographical maps are used. 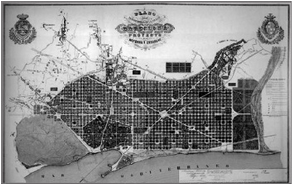 Cerda’s studies on urbanization lead to the production of his scientific urbanization document of 1861 in which he included statistics and a map (fig. 1) on the first draft for the expansion of Barcelona. For the implementation of the plan, it would need financial for the construction of roads, sanitary infrastructure, and municipal equipment and then a modality of adjusting wages. Despite these challenges, the plans were used to determine the length of blocks, the number of square meters per person and the number of inhabitants per house, and the width puff streets (Panerai et al. 2004). The plan involved inclusion of additional 1,969 hectares of medieval core by implementation of a grid of streets between the peripheral villages and the old city. 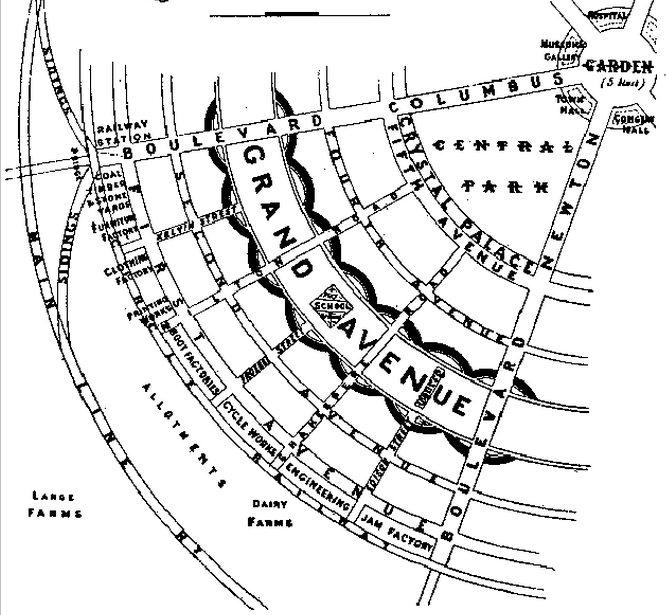 The grid had 1,000 blocks each 113.3 meters length and 113.3 meters width and streets measuring 20-30 meters wide. Each block had two parallel building (fig. 2) with each building occupying 40% of the blocks area, and yards and green spaces in between each block (fig. 3). The blocks were then connected to the street by pedestrian paths that also linked the inter-building spaces. Each block had its corner cut at 450 and 20 meters long to create squares (fig. 3, fig 4) between the octagonal blocks (Panerai et al. 2004). The industrial economy that began in mid 18th century was at an advanced stage in the 19th century, this advancement came with new challenges among them, pollution. It is this challenge of pollution in the work place and in the home that drove Ebenezer Howard to initiate the garden city movement in 1898 (Dal co, 1980). The garden city movement is an urban planning method that intended to create planned cities that were self contained with green belts surrounding them (fig. 5). These cities would have proportionate zones of residential habitation, industrial works, and agricultural production. Garden cities where also inspired by the utopian wave that existed from mid and the close of the 19th century. In his book, Garden Cities of To-morrow, Howard idealized that garden cities would have 32,000 people on a site of 6,000 acres (2.400 hectares). The garden city plan was to create concentric pattern with open spaces, parks for the public and radial boulevards 37 meters wide extending from the centre (Choay, 1997) (fig. 10). When one garden city has reached its full sustaining potential, then another city would be build nearby. In his plans, Howard had created a central city with numerous garden cities that would carry 50,000 people and the garden cities were linked by rail and roads. The characteristic feature of garden cities is the development of holistically planned new settlements that would promote a natural environment and provide high quality affordable housing and at the same time offer locally accessible employment opportunities in the beautiful, sociable, and healthy communities. This was to be achieved through the perfect and secured combination of the energetic and active city lifestyle with the delight and the beauty of the countryside. The utopian theories of 1870 and 1880 created an “evil” image of cities because of the pollution and antisocial setting in the city. Garden cities were to remedy this problem to develop them; Howard undertook a study to establish where people were most likely to go (fig. 6). Based on the study, he concluded that both the city and the countryside were not good enough based on his utopian views. The two should be enjoyed together and to do this, he integrated them into one and created the garden cities (Howard, 1902). Therefore, garden cities became one of the manifestations of sustainable development. The environment in both cerda and garden city plans is a critical issue. In both cities, the environment surrounding the residential area as well as the city is important with sustainability being inculcated in the plans. It is evident that the environment forms a policy basis in both plans. However, the strategy adapted to guide and drive the sustainability policy is very different for both cerda and garden city plans. In the case of cerda plans for the expansion of Barcelona, the environment is factored in as a factor for enhancing comfort in the city. As a result, the primary vegetations included in the plan are those within the blocks (Conzen, 1960). For every block, there is a garden at the central region of the block which is made up of public and private garden. Based on the nature of the blocks, it is evident that the legal responsibility for maintenance of the garden is on the block owner as well as the owners of the private gardens. 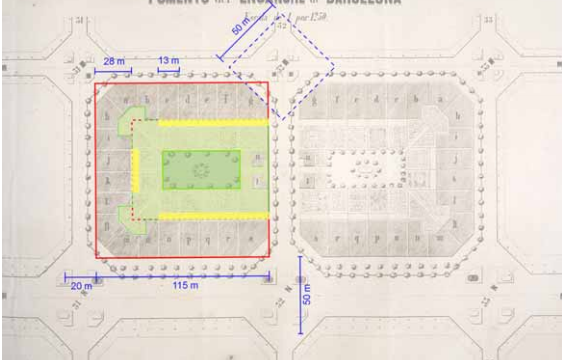 Even though the original Cerda plans do not seem to include any vegetation on the streets surrounding the blocks, pictures of cities built with the Cerda plans have shown shrubs on the streets especially on the suburbs (fig. 5). The responsibility of the maintenance of the vegetation on the streets rests with the municipal authority at the local level. On the other hand, garden cities have sustainability as a major aspect of their environmental strategy. Given the principle of the garden cities is to integrate urban setting with country setting, sustainability is a defining characteristic of the garden cities. Within each residential home is a surrounding of vegetation and the entire city is constrained by farms which form a green environment for the city (Howard, 1902). In addition, there are parks within the garden city further improving the green environment aspect of the city. It is therefore evident that sustainability for garden cities is more pronounced than in Cerda plans. That notwithstanding, the responsibility of the maintenance of garden city sustainable environment is not clear to whom it rests with. However, there seems to be a body that should be controlling the city at the local level which is responsible for the allocation of land within the garden city (Biller and Schäche, 1986). The plans do not indicate when this local governing body comes into existence or how it should function as the plans are only limited to settings of the city. For example, when one garden city is considered full, another neighboring garden city should be established. Even though it is not clear who is responsible for determining that the garden city is full or where the new city is to be located, it can only be assumed that these are the function of the central city. 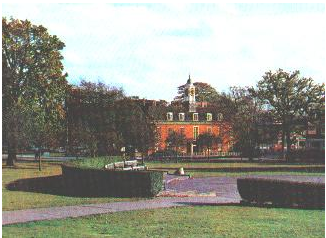 Based on the setting of the garden city, it is concluded that the form of local authority that govern the garden city is formed from the pioneer residents of the city and it is an integrative form of authority that include the residents of the city in its functions, in the formulation of policies. However, it is not clear how the authority governs the garden city. As for the case of Cerda plans, the city is subdivided into parishes and different jurisdiction regions for easy and effective administration (Anderson and MacKaye, 2002). However, the governing local body for the case of Cerda plans is autocratically oriented. Spatial planning for both Cerda plans and Garden cities is not used in a similar way creating a major difference between the two architectural designs. In Cerda plans, spatial planning is factored in between blocks, between building, and along the street. In addition, space is considered at individual level – space that each person should occupy as well as the spacing of social amenity services e.g. school, hospitals and parks (Choay, 1997). To achieve the right spacing, the basis of spacing is the size of the entire city and the population there in. On the other hand, Garden city spacing is done based on individual garden city, which are meant to be self-containing meaning, each garden city has to cater for its own social services. The primary spacing in Cerda’s plans in between the blocks (fig. 7) and this spacing determines the spacing of the entire city. One of the objectives of Cerda was to fight overcrowding which he had witnessed. To ensure that every individual had sufficient space, the blocks were built as to provide a standard space per individual. Each block has a square shape with 113.3 meters sides. The measurements of the building are scientifically calculated based on a number of factors. These are, p – the number of squares per person, v – the number of inhabitants per house, b – width of the street, d- height of the faced and f – the depth of the building site (Biller and Schäche, 1986). where x is the side of the block, the dimensions of the block was established to be 113.3 meters (Biller and Schäche, 1986). Spacing therefore, in the case of Cerda plans was based on the individuals inhabiting the building which further extended to the surrounding. Given the objective of cerda plans was to solve overcrowding and sanitation, each instrument in utilization of space is based on the users. Inter-block spacing forms the basis of public spacing. For example, the original Cerda plans were to have the building use 40% of the blocks area, but a third building was later included on one side of the block resulting to a U-shaped single block (Choay, 1997). The size of a block determines the size of the street and by extension, the spacing of the entire city. The original street spacing of the street was 35 meters but it was resized to 20-30 meters. Moreover, the side of the street was a factor in the equation used by cerda to calculate the size of the blocks. Cerda plans aimed at achieving personal space, with the standard personal space being 40 meters. 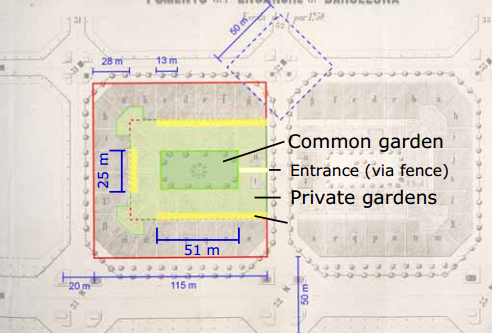 To each of the blocks, the plan has a green yard, with common and private gardens (fig. 8). The garden is located at the central area of the block, with paths and parking spaces in it. The garden in Cerda plans is used to enhance sustainability for the city. Moreover, the garden has public and private gardens where public gardens are managed by the block owner and are open to anyone residing in the block. One the other hand, private gardens is managed by individuals residing in the block and has limited access to other members of the block. In addition to inter-block spacing, the location of facilities for social services all over the city is done as to enhance optimized service delivery to the population through effective distribution. According to Pallares-barbera et al. (2011, p. 131), Cerda’s plan for Barcelona has 33 schools, three hospitals located on the edge of the city for hygienic conditions, eight parks, 10 markets and 12 administrative buildings (fig. 9). In addition to reducing overcrowding and better sanitation, Cerda planned to improve of services delivery through better and enough hospitals, education institutions, and market centers. 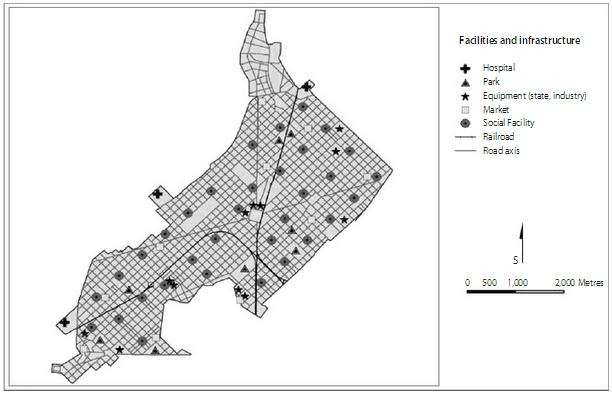 To achieve this objective, these service facilities had to be placed evenly in the city. Effective service delivery depends on the number of people depending on the facility for the service therefore, in distributing and determining the location of these facilities should have been based on the population of people per areas of the city. However, this was already taken care of because of the even distribution of the blocks within the city hence, even distribution of the people targeted by the service facilities. On the other hand, spacing for garden cities is rather different because it is based on the various activities taking place in the garden city. Space in allocated for houses, which are close to the entry point of the garden city, agricultural land, and factories at the outer of the circle before farms (fig. 10). Garden city plans do not lay firm emphasis on spacing between the various structures within the city posing the risk of overcrowding. Additionally, there is no clear number of the social facilities as well as economic facilities to be set up in the garden city hence the risk of overutilization. The population per each garden city is expected to be within 32,000 people and cover an area of 6,000 hectares. This number is expected to be effectively distributed within the garden city and supported by the garden city through the commercial facilities located therein, and the agricultural activities taking place within the garden city for the purpose of foods. However, it is not indicated how each person will be taken care of within the garden city. The plans for the garden city do not accord personal space compared to Cerda plans. This creates the risk of crowding and over-utilization mainly because there are not specific on the number of industries to be within the garden city to ensure enough employment opportunities, the size of land to be dedicated for agriculture to ensure sufficient food production, and services facilities. Because each garden city is meant to be self- containing, it has to be stable economically, administratively, and a welfare municipality. However, the location of these facilities within the Garden city is not clear. Cerda’s plan for the extension of the city of Barcelona and Garden cities are two major architectural designs of the 19th century that have served to revolutionize the industry in a great way. Both plans where developed after intensive study of the society and the housing sector in particular. Cerda’s plan was aimed towards provision of better social services in housing, health care, and sanitation. On the other hand, Garden cities movement primary Objective is develop planned self-contining, and sustainable cities. 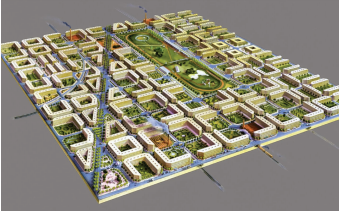 While the planning of for Cedra plans has the block as the basic unit, Garden cities operate under the Garden city. Therefore, the spatial instrumentalities of Cedra plans are for the block and for inter-blocks which by extension, is the scalke for the entire city. On the other hand, Garden citiesmovement base their spatial priciples on the entire garden city. Anderson, L. and MacKaye, B. 2002, Conservationist, Planner, and creator of the Appalachian Trail. Baltimore: The Johns Hopkins University Press. Biller, T. and Schäche, W. 1986, Notes on the rise, development and destruction of a block in Friedrichstadt, Architectural Design Profile pp. 20-26. Choay, F. 1997. The Rule and the Model. On the Theory of Architecture and Urbanism, Massachusetts, MIT Press Chapter 6 on Cerda. Conzen, M.R.G. 1960, Alnwick, Northumberland: a study in town-plan analysis, Publication no. 27, Institute of British Geographers, London. Dal co, F. 1980. From Parks to the Region: Progressive ideology and the Reform of the American City. The American city: From the Civil War to the New Deal. London: Granada. Howard, S. E. 1902. Garden Cities of To-morrow The Town and Country Magnet. Kropf, K.S. 1996, Urban tissue and the character of towns’, Urban Design International vol. 1 no. 3 pp. 247-263. Moudon, A.V. 1997, Urban morphology as an emerging interdisciplinary field, vol. 1, pp. 3-10. Panerai, P., Castex, J., Depaule, J. C. & Samuels, I. 2004. Urban Forms: The Death and Life of the Urban Block, Ch. 2 London, the Garden City.